When running out of the hard drive capacity on the Synology RS3411xs/RS3411RPxs and RS2211+/RS2211RP+, the Synology RX1211/ RX1211RP provides an easy way to immediately scale capacity by additional 12 hard drives. The RAID volume on the Synology RS3411xs/RS3411RPxs and RS2211+/RS2211RP+ can be expanded directly without having to reformat the existing hard drives, ensuring the Synology RS3411xs/RS3411RPxs and RS2211+/RS2211RP+ continues its service during the capacity expansion. When created as an independent volume, the Synology RX1211/RX1211RP provides an easy solution for backing up the Synology RS3411xs/RS3411RPxs and RS2211+/RS2211RP+. 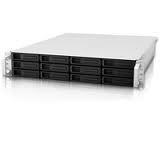 SKU: RX1211RP-24TB55 Category: 2RU NAS Expansion Units. The Synology RS3411xs/RS3411RPxs and RS2211+/RS2211RP+ securely connects to the Synology RX1211/RX1211RP with an InfiniBand cable, offering high-bandwidth connectivity to further ensure efficiency. It allows the hard drives in the connected Synology RX1211/RX1211RP to operate as they are the internal ones of the Synology RS3411xs/RS3411RPxs and RS2211+/RS2211RP+, with no lag in data retrieval. HDD hibernation or HDD deep sleep mode can be configured to take effect automatically when the system has been inactive for a specified period of time. This not only saves energy but also extends the lifespan of the hard disks. Synology RX1211/RX1211RP is managed with Synology DiskStation Manager, no additional software installation is required.